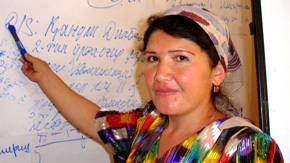 The project improved the quality of life for diabetics in Uzbekistan by facilitating a change in attitude towards self care, a healthy lifestyle, and personal responsibility. Public health care provision for diabetes care has decreased in Uzbekistan over the last years. As a result, only 15-20% of patients receive the required medication. Also, many people with diabetes - having been used to "the State taking care of them" - are finding it difficult to assume responsibility for their own care. This project seeks to address this situation by establishing 14 diabetes information centres, each with a diabetes school teaching self-care and management to people with diabetes. The project seeks to improve the quality of life and promote a change in attitude among people with diabetes towards self care and personal responsibility, and provide the information and resources to facilitate healthy lifestyles. Through the establishment of 14 regional diabetes information centres the project aims to provide information, resources and other facilities for people with diabetes throughout Uzbekistan. Information and training will also be provided for doctors and nurses to support these centres. All cost for staff and facilities will be covered by the Ministry of Health as the centres are fully integrated into the public health system. Under the coordination by the Association of Endocrinologists, the centres will be joined in a network to facilitate the exchange of information and the effective provision of services. At the centres, people with diabetes as well as people at risk or relatives can obtain information on diabetes, risk factors, prevention and healthy living. Each diabetes school will provide in-depth information to 20 people with diabetes each month. Specialised seminars will be conducted for doctors and nurses from each region with a view to raise the general level of diabetes care provided for people with diabetes. In addition, a newsletter will be issued and a website will be launched. The purpose of the newsletter is to provide even more information to people with diabetes and to reach beyond those visiting the centres. The website seeks to facilitate the exchange and spreading of information among the centres, including providing the health care professionals working in the centres with the latest and up to date information on treatment and prevention.